Baroness Newlove saw for herself last week some of the innovative anti-binge drinking projects she is supporting around the country. The government’s Champion for Active and Safer Communities, visited projects in Wakefield, West Yorkshire and Great Yarmouth, Norfolk that are being funded to test ideas to help reduce problem drinking and related anti-social behaviour. In Wakefield, ‘Positive Choices’, a grassroots project that pulls together proven methods for tackling problem drinking and run by the local Neighbourhood Policing Team, is working with community groups and young people to achieve a long term, measurable impact on the way they perceive, experience and consume alcohol. “Positive Choices is a real community partnership backed by the local authority and police. But most importantly, the young people of Castleford will be actively involved throughout. “Securing the £90,000 investment from the Department of Community and Local Government Alcohol Fund was hugely positive for the town and its young people and we already have seen the opening of excellent new faciities making a difference to the lives of local youngsters such as the Hut. Later in the week Baroness Newlove visited Great Yarmouth to meet local residents running ‘The Den’, a Life Skills Project offering training sessions on everything from cooking, budgeting, running a home and parenting through to support on more complex issues such as drug and alcohol misuse and behaviour issues including anti-social behaviour and domestic violence. The 2 projects are part of a national network of 20 grassroots programmes working to tackle binge and underage drinking and anti-social behaviour which Baroness Newlove is supporting. 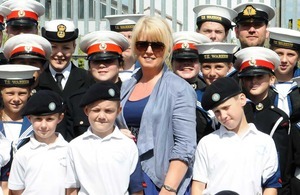 While in Great Yarmouth Lady Newlove officially launched a training boat - the Newlove - to be used by young members of TS Warrior, the local cadet unit. Funded by Community Alcohol Partnerships, the boat will be used to give older members of the Warrior, the opportunity to participate in hands-on experience, training and qualifications, which they can then use to get jobs in offshore industries in the town.